THE 2018 EDITION of the BFAP South African Baseline presents an outlook of agricultural production, consumption, prices and trade in South Africa for the period 2018 to 2027, within the context of the current uncertainty regarding land reform policies. The information presented is based on assumptions about a range of economic, technological, environmental, political, institutional, and social factors. The outlook is generated by the BFAP system of models. A number of critical assumptions have to be made for baseline projections. One of the most important assumptions is that normal weather conditions will prevail in Southern Africa and around the world; therefore yields grow constantly over the baseline as technology improves. Assumptions regarding the outlook of macroeconomic conditions are based on a combination of projections developed by the International Monetary Fund (IMF), the World Bank and the Bureau for Economic Research (BER) at Stellenbosch University. Baseline projections for world commodity markets were generated by FAPRI at the University of Missouri. Once the critical assumptions are captured in the BFAP system of models, the Outlook for all commodities is simulated within a closed system of equations. This implies that, for example, any shocks in the grain sector are transmitted to the livestock sector and vice versa. Therefore, for each commodity, important components of supply and demand are identified, after which an equilibrium is established through balance sheet principles by equalling total demand to total supply. This year’s baseline takes the latest trends, policies and market information into consideration and is constructed in such a way that the decision maker can form a picture of equilibrium in agricultural markets given the assumptions made. However, keep in mind, markets are extremely volatile and the probability that future prices will not match baseline projections is therefore high. Given this uncertainty, the baseline projections should be interpreted as one possible scenario that could unfold, where temporary factors (e.g. weather issues) play out over the short run and permanent factors (e.g. biofuels policies) cause structural shifts in agricultural commodity markets over the long run. The baseline, therefore, serves as a benchmark against which alternative exogenous shocks can be tested and interpreted. In addition, the baseline serves as an early-warning system to inform role-players in the agricultural industry about the potential effects of long-term structural changes on agricultural commodity markets, such as the impact of a sharp increase in input prices or the impact of improvements in technology on the supply response. To summarise, the baseline does NOT constitute a forecast, but rather represents a benchmark of what COULD happen under a particular set of assumptions. Inherent uncertainties, including policy changes, weather, and other market variations ensure that the future is highly unlikely to match baseline projections. Recognising this fact, BFAP incorporates scenario planning and risk analyses in the process of attempting to understand the underlying risks and uncertainties of agricultural markets. Some of the boxes in the publication present results of a number of specific or commissioned analyses through the past 18 months. Farm-level implications are included in the commodity specific sections and the scenarios and risk analyses illustrate the volatile outcome of future projections. Additional stochastic (risk) analyses are not published in the baseline, but prepared independently on request for clients. 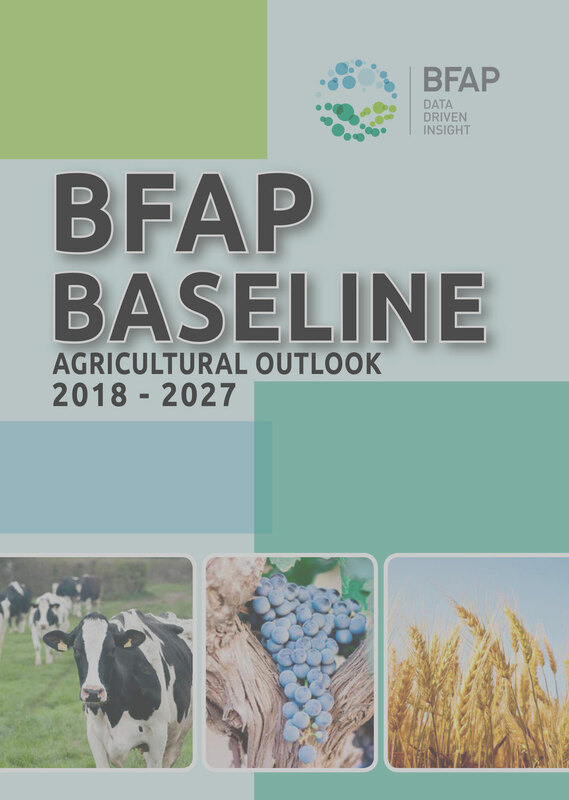 The BFAP Baseline 2018 should thus be regarded as only one of the tools in the decision-making process of the agricultural sector, and other sources of information, experience, and planning and decision-making techniques have to be taken into consideration.